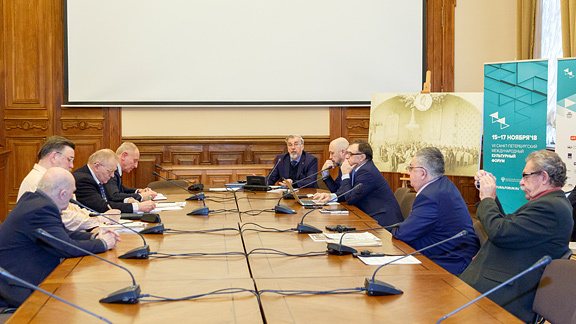 On 16 November 2018, as part of the 7th Saint Petersburg International Cultural Forum, a round-table discussion was held in the State Hermitage on “Heraldry in Everyday Life”. The participants in the discussion were greeted by Mikhail Borisovich Piotrovsky, General Director of the State Hermitage, who stressed the importance and significance of this part of the Forum. Heraldry is an inseparable part of the social environment. Participants in the seminar discussed the penetration of heraldic symbols into the corporate culture of organizations, the way the “language of symbols” manifests itself in the Church and what place it occupies in youth culture and sport. A lively discussion arose over a question relating to the interaction of heraldry and graphic design. The participants in the round table were Russian and foreign specialists in the field of heraldry. This event was followed by a special session held in the Hermitage of the Heraldic Council of the President of the Russian Federation.